The winds have hardly blustered at Carnoustie this week but Justin Rose still needed a last-gasp birdie yesterday to avoid being beached on the Angus coast. And while it seemed all English hopes now rested on the glossy man of Tommy Fleetwood, Rose capitalised on the benign morning conditions at Carnoustie to score seven birdies on the way to a blemish-free 64 this morning. 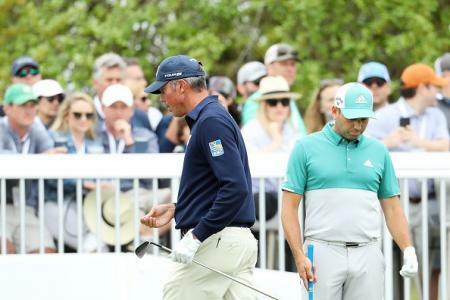 The score equalled the Open Championship record at the course, set by Steve Stricker in 2007, and saw the world no.3, albeit temporarily, surge into the top-10 hours before leaders Kisner and Johnson would tee-off. Rose might have found it peculiar taking to the tee in just the third group of the day having finished in the top 15 at both Majors this year but he continued his late resurgence by immediately birdieing the first. After a steady but unspectacular 34 (-2) front-nine, he may well rue some of the early putts missed which could have easily seen him set the new championship record at Carnoustie. Rose has come back from nine shots in Turkey and eight in Shanghai to win before so it’s hardly surprising that the Englishman came out so aggressively after making the turn. His ball striking was imperious, sweeping five birdies, including another on 18, which would leave him on -4 at the close of play.